Daily Illuminator: Who Rules The Disc? March 30, 2017: Who Rules The Disc? The Discworld Roleplaying Game isn't just a great sourcebook on Sir Terry Pratchett's beloved universe (although it is that, as we showed recently). As its title implies, it's also a roleplaying game . . . and a game needs rules! Today's PDF preview presents a few of the "crunchier" parts of the Discworld Roleplaying Game. You'll get insight into playing a supernatural personification (not that uncommon on the Disc! ), the mechanics of the magic system, and a couple of oddball enchanted items. 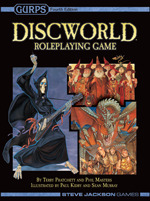 The Discworld Roleplaying Game is built on an award-winning rules foundation. Whether you're new to GURPS, or to roleplaying in general, or looking for a stand-alone product that's fully compatible with the vast GURPS library, you can be confident that it's right for your campaign!